The U.S. Department of State (DOS) has released the March 2015 visa bulletin showing very little movement in family based categories with oversubscribed visa numbers. Visa dates are announced by the DOS every month. Only applicants who have a priority date earlier than the cut-off date may be allotted a number. Should it become necessary during the monthly allocation process to immediately retrogress a cut-off date, supplemental requests for numbers will be honored only if the priority date falls within the new cut-off date. If you have filed an employment based or family based immigrant petition (I-130 or I-140) it is important that you are aware of your priority date as you may be eligible to file for a green card (adjustment of status). Nearly all of the family preference categories have advanced by 1-2 months for most countries aside from Mexico and the Philippines. The exception to advancement is the F3 category for married sons and daughters of U.S. Citizens which has only advanced by a few weeks for all countries. There are many different categories in which U.S. Citizens can sponsor their family members. This includes the F1 category for Unmarried Sons and Daughters of U.S. Citizens, the F2A category for Spouses and Children of Permanent Residents, the F2B category for Unmarried Sons and Daughters (21 years of age or older) of Permanent Residents, the F3 category for Married Sons and Daughters of U.S. Citizens, and finally the F4 category reserved for the Brothers and Sisters of Adult U.S. Citizens. While we hope to see relief for those waiting in all countries there are still major backlogs for both Mexico and the Philippines leaving those family members in the F-4 categories who filed back in 1997 and 1991 an extensive amount of time (25 years)before their numbers become available. We hope that all families awaiting the immigration of their loved ones find relief in the future. We are pleased to see an advancement of six months in employment based 2nd (EB-2) preference categories for China. February’s EB-2 category had priority dates for China’s EB-2 category stuck at March of 2010 however this month they have advanced to September of 2010. Nearly 6 months! There is even better news for India’s EB-2 Category. 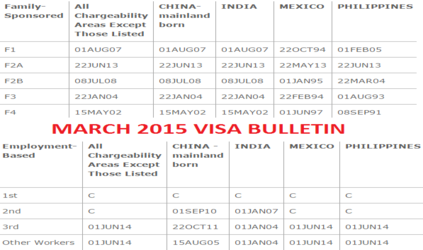 India’s February visa bulletin numbers in EB-2 Category were stuck with priority dates of September 2005. It is amazing how much advancement comes for March as the India EB-2 category priority dates are now at January 2007. Although the EB-2 advancement of priority dates is wonderful, we remain extremely disappointed with the lack of advancement in EB-3 category. Visa numbers for China and India have only advanced by a few weeks while all chargeability areas, including Mexico and the Philippines continue to advance at a greater rate. Many H-1B visa holders can apply for permanent residence through their employers. There are many immigration law firms in Orange County which specialize in PERM Labor Certification. If you are considering pursuing permanent residence in the U.S. (green card status) you should first discuss the matter with your employer. If you are a corporation looking to sponsor an employee for PERM, it is vital that all of the regulatory steps are met during the process. Our immigration attorney provides Free Consultation in employment based immigration as well as family immigration. Make sure to stop by our website for the latest updates and information on the DOS Visa Bulletins. If you believe that your visa number is current please contact our immigration lawyer in orange county who can provide you with assistance for obtaining your green card. We offer free consultation at our office near Anaheim. Pursuant to INA § 245(a)(3), aliens with priority dates prior to the cut-off dates shown on the Visa Bulletin will be eligible to file adjustment of status (green card) applications during the month of March 2015.